There was a recent question in the VMware PowerCLI community about changing the boot order for a VM (Change Boot Sequence with new Extensiondata option). In looking into this, I found that the VirtualMachineBootOptions item has a BootOrder property with which one can change the VM's boot order (new in vSphere API 5.0). Upon searching about to see if there were already examples of using this property for changing boot order, I found none. There are places that talk about changing/limiting what boot devices a VM may use in order to boot from the given device, but none that dealt with changing the actual boot order on the VM. So, I whipped out an example (that person was wanting to use the ExtensionData property of a VM object). The BootOrder property can have four (4) different types of devices (which are VirtualMachineBootOptionsBootableDevice objects): CDRom, disk, ethernet, and floppy. The CDRom boot device does not correspond to any particular CDRom on the VM -- per the docs, when the boot order specifies CDRom, the first CDRom with bootable media found is used. 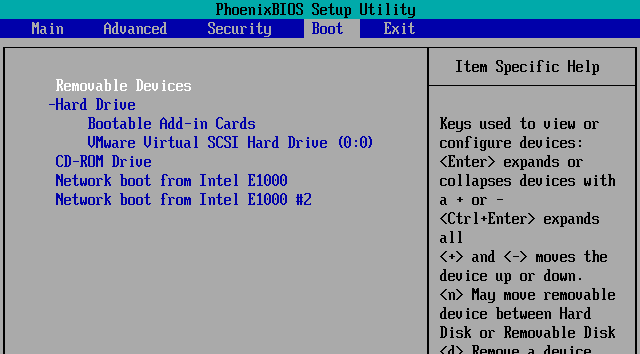 The disk and ethernet boot devices are related to the actual VirtualDisk and VirtualEthernetCard devices on the VM by specifying the corresponding Keys for the given devices. $strBootNICDeviceName = "Network adapter 2"
$strBootHDiskDeviceName = "Hard disk 1"
...where 4001 is the DeviceKey of the second virtual NIC in the VM, and 2000 is the DeviceKey for the first virtual disk. 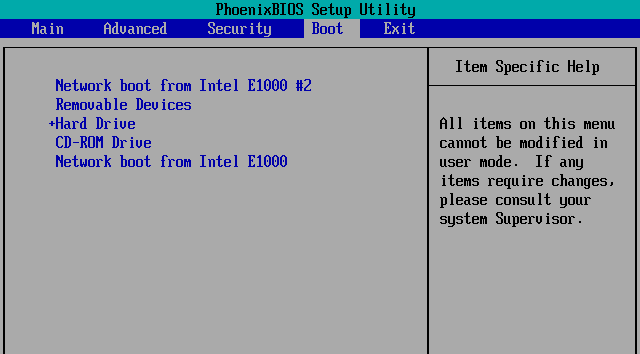 Notes about setting the boot order in this manner: once you have done so on a VM, it appears that the boot order can only be changed via script. Notice in the first screenshot that one may use keys to navigate between items, whereas the second screenshot states that "All items on this menu cannot be modified in user mode". Something to keep in mind. Additionally, this method does not seem to have control over where the "Removable Devices" item appears in the boot order.